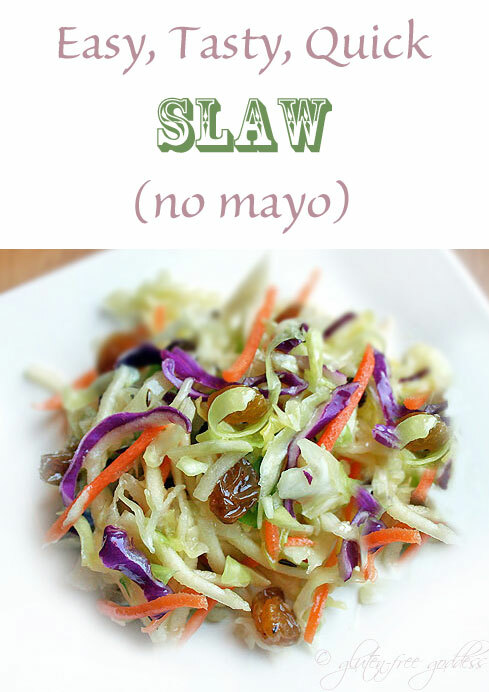 A tasty slaw recipe without a drop of mayo. Here's a crisp and crunchy slaw recipe without a drop of mayo. That's what I'm craving. How about you? Stop by and share your favorite spring side dish recipe in comments. From the archives: By April I'm itchy with anticipation. By May I'm storing sweaters and mittens. Winter is behind us. Spring is officially here. Days are longer, inch by inch. If not for juniper allergies I might even be out walking, testing out my new cocoa suede sneakers- albeit gently, Dear Reader, treading softly down our bumpy dirt road, shiny new walking cane in hand. And while I believe the Sweet Husband when he tells me he likes me with more meat on my bones- and who am I to complain about (finally!) absorbing food and calories after years of celiac malabsorption- your intrepid expanding goddess is simply hankering for lighter fare. Something to perk up the taste buds. Something with snap and crunch. Something fresh and green that makes you feel virtuous and light and happy to be alive with summer on its way. This fresh and simple slaw is not only gluten-free, it's dairy-free and egg-free. Not a dab of mayo in sight. Change out the golden raisins with dried cranberries for an unexpected twist. I made this up for Alex and Jessica- on the spur of the moment- inspired by Nava Atlas. I reviewed one of Nava's vegetarian cookbooks here. Toss the shredded cabbage, apple, carrot, red onion and golden raisins into a large bowl and stir to mix. Drizzle with the olive oil- enough to coat, but don't drown it. Sprinkle with vinegar, agave nectar, caraway, dill, cumin, sea salt and pepper, to taste. Toss to coat. Taste test- does it need more oil? More vinegar? A tad more caraway? Sea salt? Adjust the seasoning.